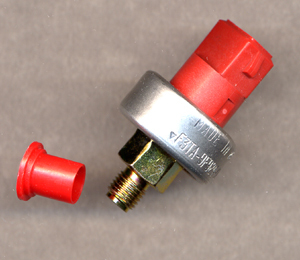 showing threaded connection to Brake Master Cylinder and aluminium clamping ring that hold switch and pressure sensing element together. 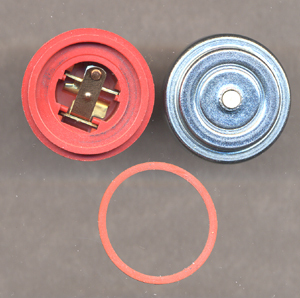 Note that the pressure sensor element has a circular fulcrum such that as the pressure rises the outer annulus of the pressure diaphragm moves outward and the inner annulus moves inwards so that the ceramic pin, rather counter-intuitively, moves inwards into the housing allowing the switch to snap open. Parts 1 to 5 assemble as follows: plastic disc(2) fits into (1). Steel convex disc (3) goes on top of (2) and fits into (1). (1-3) fit into underside of housing (5). ceramic pin (4) fits into hole in (5) and rests against convex surface of (4). 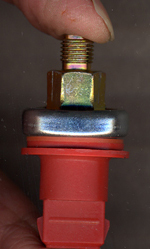 Other end of pin (4) exerts pressure on switch to close it during normal operation. 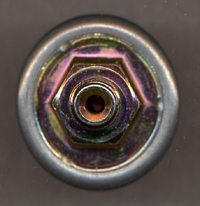 When pressure rises pin (4) retracts into housing (5) and opens switch. Part (6) houses elastomer ring (7). 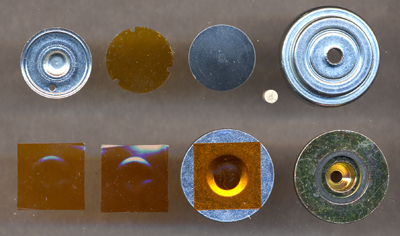 Steel annulus (8) has a Kapton square (9) placed upon it as shown. Kapton squares (10) and (11) are placed on (9) to form a three layer diaphragm. Parts (1-5) are turned over so that raised centre of (1) is facing. Steel annulus (8) is placed on top of parts (1-5) so that raised centre of (1) protrudes through the hole and comes in contact with diaphragm (9). Parts (6) combined with (7) are turned over so that diaphragm (9-11) is clamped between (6+7) and steel annulus (8). Rim of housing (5) is spun over edge of (7) to hold sub-assembly together as a single unit.